This evening I unleash my true geekdom on you. I am not ashamed to say I am a huge animation fan, of all kinds. I appreciate that this doesn’t fit with my passion for poor horror, gorefests and satirical writing, but any animation is a beautiful thing. The skill it takes to make a feature length film, where you can easily associate with characters and be transported to the world created by the artists is a true talent. Spirited Away is by far one of my favourites, although Studio Ghibli have produced many of my top animated films and has inspired several of my tattoos through its striking imagery. I’ll try and sum up the story line in a nutshell…Chihiro, a spoilt and bratty kid is sulking as she and her family are moving. During the drive to their new house, her father (being a typical man and doesn’t want to ask for directions) gets lost, but they find an interesting spot and decide to investigate, wondering through a tunnel they come across what appears to be an abandoned village, but in one of the stores, it is laiened with freshly cooked food. Mother and father start to eat…with apparently no table manners as Chihiro stands back worrying about the fact that there is no one around. As her parents chow down like they have never seen food before, they transform in to pigs. Chihiro becomes distressed, and the world around her starts to change and she starts to literally fade away. Enter Haku, who comforts Chihiro and gives her some pills (remember say no to drugs kids…especially from strange boys who can turn in to dragons) which make her solid again. Haku smuggles Chihiro in to a bathhouse, which is run by a witch called Yubaba. It transpires that the many spirits of Japanese culture visit this bathhouse, and if Chihiro wants to see her parents again she must work there for free and figure out a way to get them back. Chihiro trades her name with Yubaba for a job, and she is given the name of Sen. She signs a contract that states if she forgets her real name she will work for Yubaba forever. With me so far? I hope so. Sen tries to get work in the boiler room with Kamajii, who rejects her, but is begrudgingly taken under the wing of Lin who is a servant in the bathhouse. The bathhouse servants are mostly out for themselves and are made up of talking frogs, entities that look human and other variations on reptiles. All are represented as very selfish and fairly unhelpful to Sen. It is uncovered that Haku is also working for Yubaba, but is in training to help her and her wicked plans, and as he has completely forgotten his name seems destined to work for Yubaba forever. While working in the bathhouse Sen sees what she thinks is a spirit stood out in the rain and lets him in, the striking spirit is just a dark entity with a white mask and becomes known as no face. No face takes a liking to Sen because she let him in the bathhouse (the first sign of compassion from this before whiny and self centred child). He attempts to help her during her work especially during the bathing of a particularly difficult spirit who turns out to be a powerful river spirit who gifts Sen with a strong emetic. Later Sen sees Haku in his dragon form and helps to save him from an attack from paper birds. In search of the injured Haku, Sen discovers that Yubaba has a giant baby son and 3 heads which jump around the floor acting a little like guard dogs. Finding Haku, Yubaba’s twin sister, Zeniba, turns up and states that Haku has stolen her sigil. Zeniba then turns giant baby in to a mouse and Yubaba’s pet crow in to some form or small yellow bird…just for fun. Before leaving Zeniba tells Sen that Haku has a stolen the magic sigil and it carries a deadly curse. Haku rips up any remaining paper birds and Zeniba disappears. Haku then disappears down to the boiler room and Sen follows with mouse and bird in tow. Sen feeds Haku part of the emetic that she was gifted and a black slug along with the sigil, is expelled by him, she stamps on the black slug. Haku then falls in to a coma. Due to the feelings she has for Haku, Sen decides that she is going to return the sigil to Zeniba to try and lift the curse on Haku. Mean while, no face is causing havoc in the bathhouse. He has become intoxicated with the greedy behaviour of the people around him and has eaten all the food in site and has now started to eat the servants, all the while calling out for Sen.
Before Sen leaves the bathhouse to visit Zeniba she manages to fed no face the rest of the emetic which makes him sick and start to regurgitate the people he has eaten. Returning to his normal size and demur personality. Following Sen, no face, bird and mouse all decide to make the journey to Zeniba’s house to return the sigil. On arriving Zeniba is welcoming and thanks Sen for returning the sigil. The curse is now lifted on Haku but through the love that Sen has for Haku, and Zeniba explains that mouse and bird could have turned back to their original states long ago but they have decided to remain in the form she transformed them in to. Zeniba explains that the black slug was a curse from Yubaba on Haku and was how she had been controlling him. 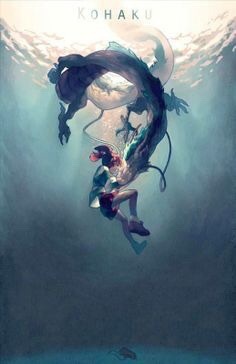 Haku turns up in dragon form to help Sen return to the bathhouse and on the journey back Sen realises that she knows Haku and that is is a river spirit of the Kohaku river which has been filled in which is why he couldn’t return to his earthly place. Haku now remembers his real age and Yubaba’s spell over him is broken. On returning to the bathhouse, mouse and bird return to their form and fight for Sen’s parents to be returned to her, Yubaba makes a bet that if Sen can identify her parents in a pen of pigs they can all go free. Sen correctly says that her parents are not in the pen. True to her word Yubaba releases Sen’s real name and her parents and they return to the real world, her parents seemingly not remembering anything. 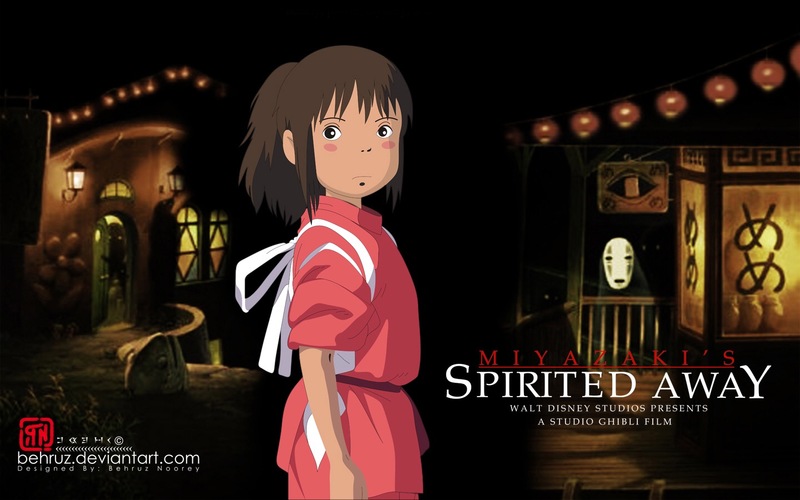 That is the abridged version of the story line and yes this really is a kids film which was lovingly created by Hayao Miyazaki, as he felt there were not enough films out there for ten year old girls. Miyazaki is truly an amazing talent as he writes, directs and produces all of the films he puts his name too, and is well known for starting a work without a script and just works from story boards. There are many themes running through this complex animation. The first being the coming of age theme. Chihiro transforms from being a bratty and insolent child to being a thoughtful and caring one. The transformation is suggested to also represent the modern culture of Japan balanced with the traditional one. There is a strong theme of environmental awareness in this film, it shows a river spirit covered in all kinds of human waste, turning up to the bathhouse to be replenished. Each spirit that visits is a natural spirit of some kind, coming away from their earthly habitiate to revive themselves, only Haku can’t return and his earthly home has been destroyed. Lets get down to brass tacks, this is a kids film and the bathhouse is a kids perception of what is actually a brothel. Yubaba is the extravagant and controlling Madam only interested in making money and less interested in the well fare of her workers. Also with hints of slavery, through the working for free and forever due to lose of identity. This now gives the film a sinister twist especially when you consider that no face keep trying to give Sen money and tokens. Subtle imagary supports this train of thought from the sign over the bathhouse door, which reads “hot water”, traditionally in Japan these hot water houses where places of ill repute. Yubaba is transitionally a name for a madam in a brothel. There are also other small indicators throughout the film, from written signs and art work around the bathhouse. Putting aside the mature conspiracy theory of the more sinister side of this film, this is a multi award winning, universally loved film with cute characters and an endearing story line. If you haven’t seen this, or think you are not an animation fan, I strongly recommend you give this a go. There are beautiful depictions of landscapes, well put together plots lines and soot sprites that carry stars…what’s not to love? ?